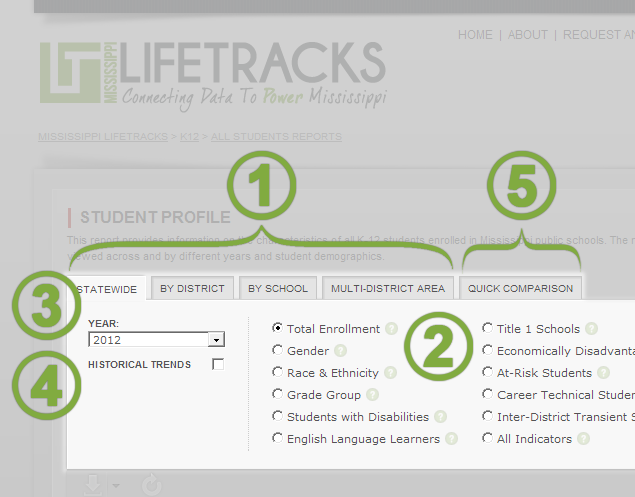 The LIFETRACKS home page presents links to the five major categories of reports available from the application. Clicking on the areas labeled through will direct you to a list of available reports in the selected category. Page header navigation is present at all times while using the application and provides direct access to any of the 5 main categories, as well as a list of all available Ad Hoc Reports. 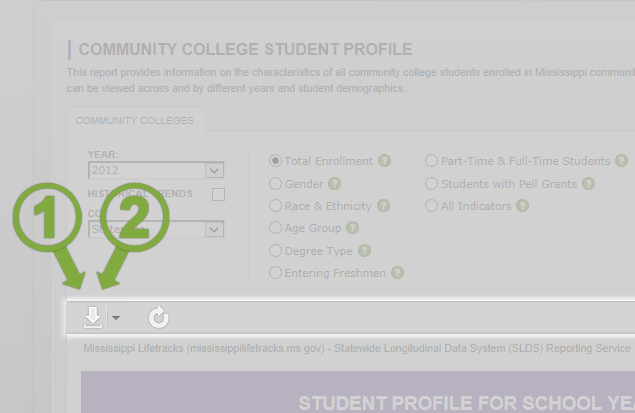 Throughout the application breadcrumb navigation is available at the top of the page just below the LIFETRACKS logo. Breadcrumb links allow you to retrace your through pages you have visited. 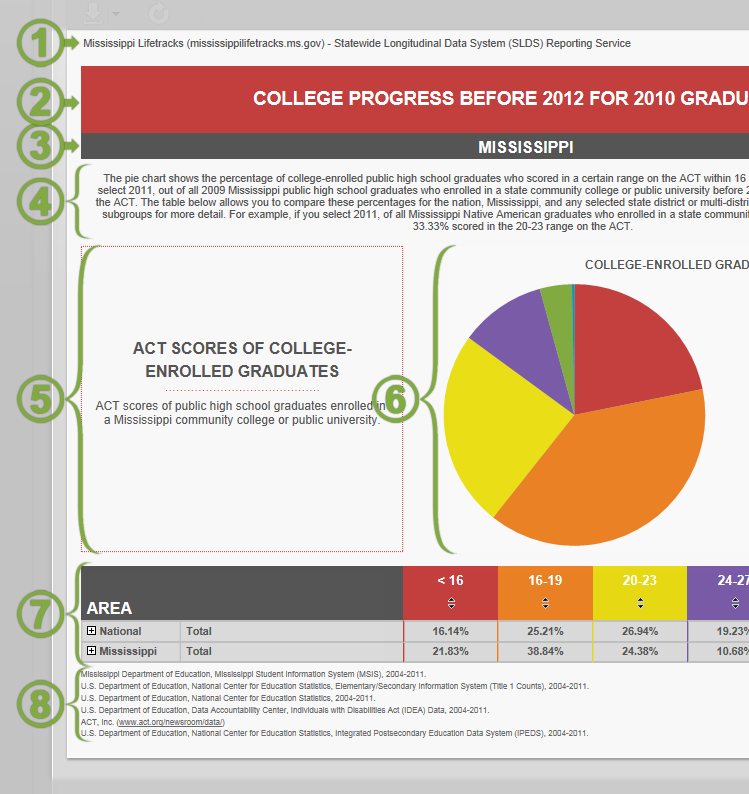 Statewide - This view presents cumulative or average numbers across all districts or institutions in the state. By District - For categories where this selection is available, this view presents numbers for a selected district. You can select a district from a dropdown list or by clicking on a map of the state. By School - For categories where this selection is available, this view presents numbers for a selected school or institution. First, select a district from a dropdown menu. A list of schools in the selected district is presented. Select a school from the list in order to view the report. Multi-District Area - For categories where this selection is available, custom regions can be created by selecting any number of districts. Select districts from a check list of by clicking on a map of the state. Selected districts are highlighted. When you have made your selection, click "Run Report." SELECT A YEAR - A dropdown list displays the available years for the selected report. Some indicators require multiple years for calculation, so the report view may not be available for every year. VIEW HISTORICAL TRENDS - Check this box to view the selected indicator across all of the years available. QUICK COMPARISON - For categories where this selection is available, compare two or more schools or districts in a table displaying all of the indicators for the selected report. First, choose whether to compare districts or schools. Compare Districts - Select the "Compare Districts" radio button. Use the check list of the map of the state to select two or more districts to compare. Click "Run Report." Compare Schools - Select the "Compare Schools" radio button. Click on a district in the list or on the map of the state to expand the entry and view the list of schools in the district. Use the check list of select two or more schools to compare. Click "Run Report." 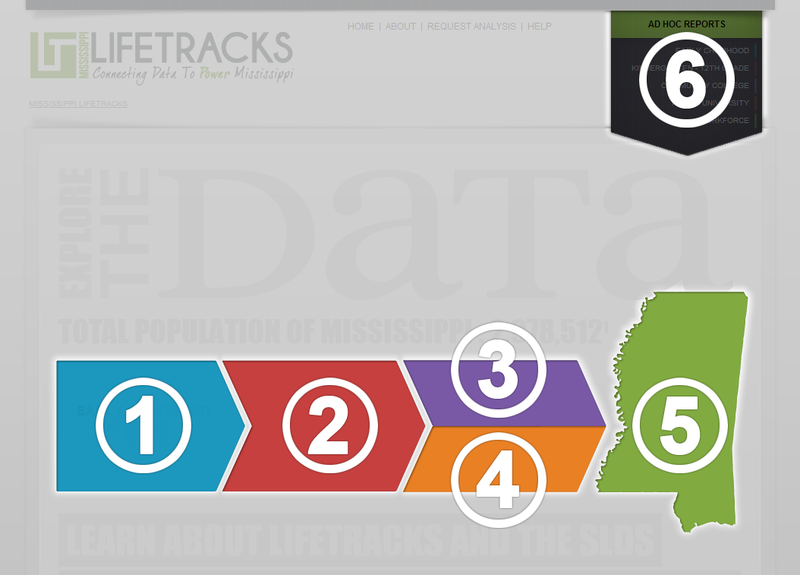 HEADER - Report source, including link to Mississippi LIFETRACKS website and the date the report was created. REPORT TITLE - A descriptive name for the subject and the year or years being reported on. AREA/INSTITUTION - This is the geographic area or the specific institution containing the population being reported on. REPORT DESCRIPTION - This text explains how to read the information included in the selected report. INDICATOR BOX - Indicator name, description, and value. CHART - When applicable, information is displayed as a chart. SUBGROUP TABLE - The indicator value for the selected area, as well as for the state and the nation where applicable, is further broken down by specific subgroups. Refer to the Report Description above for an explanation of how to read the table for the selected indicator. DATA SOURCES - The list of data sources used in the selected report are displayed here. EXPORT FILE - Select a file type (XML, CSV, MHTML, Excel, TIFF, Word) and download. PRINT REPORT - Click the "Export File" icon and select file type PDF. Your browser will ask if you wish to open or save the file. Select "Open." With the file opened, you may print the report as you would any other PDF. Authorized users must log into the system to view restricted-access reports. Click the "SIGN IN" button in the lower left of the page. You will be prompted to enter a user ID and password. Once you have logged in, the restricted-access reports that you are authorized to view will now be available in your list of reports. 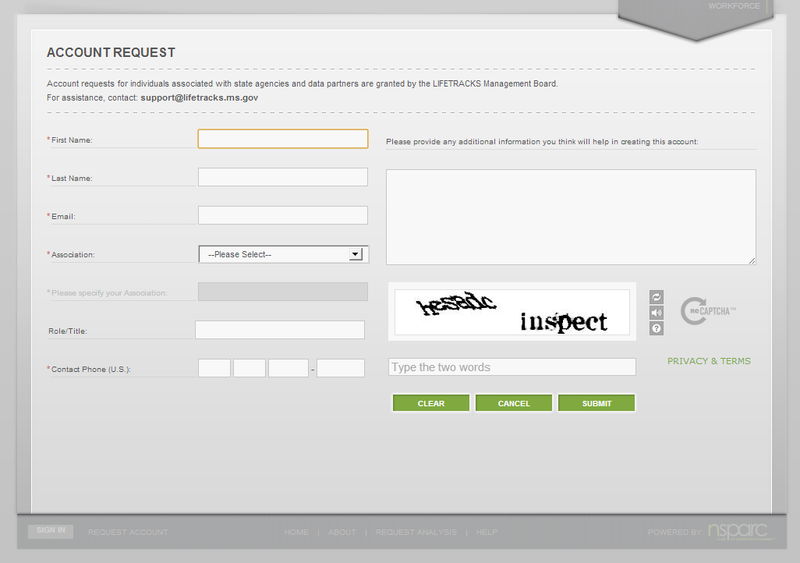 To request a user account, click on the "REQUEST ACCOUNT" link next to the "Sign In" button. Enter your contact information, including a selection of an "Association," to aid the LIFETRACKS administrator in directing your request to the proper state agency administrator. Once your request has been reviewed you will receive an email asking you to confirm your new account or explaining why the request was denied.